Now that the hardware's put together, the next step is installing the operating system. 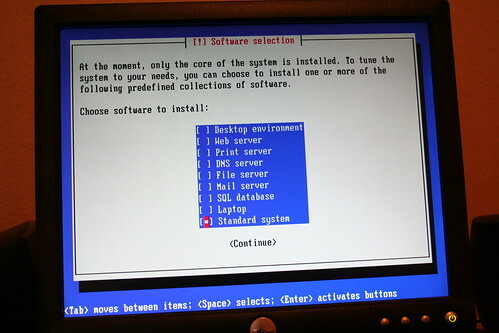 As I mentioned earlier, my goal here is to install Debian Etch (actually, for reasons related to my backup policy, I ended up going with Debian Lenny; the install process is almost exactly the same, but you get slightly newer software) onto the onboard CompactFlash card without having to install an optical drive to do it. I considered doing a PXE network install, but it looked pretty complicated given that I don't have any other servers in my network setup...so instead, I set up a bootable SD card installer and worked from there. 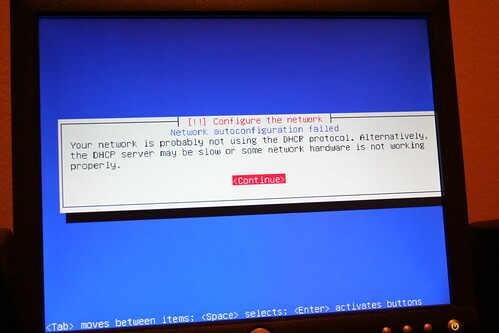 DHCP fail: "Your network is probably not using the DHCP protocol. 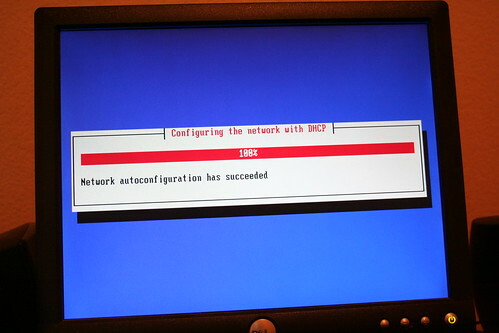 Alternatively, the DHCP server may be slow or some network hardware is not working properly." This procedure will totally erase anything you've already got on your SD card. Make sure you back it up first. First, take the card out of the machine. Then, run tail -f /var/log/messages so you can see what new device shows up when you plug the card back in. In my case it turned out to be /dev/sdd ...but don't take my word for it, run the test yourself. You don't want to overwrite the wrong device! Once you know which device you'll be writing to, you can copy and paste the following code into a file, make it executable (chmod +x filename), and run it with the device filename as its sole argument (e.g., if you save it as "createbootsd", you'd run ./createbootsd /dev/sdd). # The $1 argument should be the full path of the SD card's device special file. You'll need to give your machine a host name early on in the installation. You'll probably end up using this host name a lot when you connect to the machine over the network, so pick something you'll enjoy remembering. It'll also ask you for a domain name. In my case, I used a domain name I pulled from my router's configuration page. In practice, I don't know that this will matter too terribly much for a home network, and the installer says as much. Select the disk from the list; it should have "hda" in its name, since it's the /dev/hda device. When asked about creating an empty partition table on this device, choose "Yes". It'll take you back to the first screen, but there should now be an entry right underneath the original "hda" entry, whose label ends with "FREE SPACE". Select that entry. Choose "Create a new partition." The default partition size should be fine, since we just want a single partition using up the entire device. Choose "Primary" when asked what type the new partition should be. When you've got it configured, choose "Done setting up the partition." Choose "Finish partitioning and write changes to disk." It'll warn you about how you haven't set up a partition for swap space; don't worry about this, as we definitely do not want a swap partition on the CF card. That'd wear it out pretty badly. Choose "No" to get past this message. One more warning screen; when you're asked to write the changes to disks, choose "Yes". Choose "Standard system;" we'll install everything else manually later on. 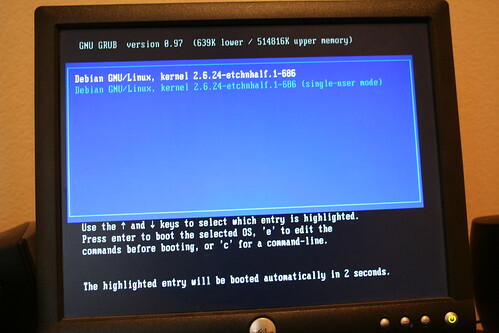 And, of course, make sure to install the grub boot loader when asked. Next time I'll show you what steps I took post-installation to secure the machine and make it run more efficiently; then, eventually, we'll pop in a hard drive and get our RAID-1 array going.